It's the pesticide on our dinner plates, a chemical so pervasive it’s in the air we breathe, our water, our soil, and even found increasingly in our own bodies. Known as Monsanto's Roundup by consumers, and as glyphosate by scientists, the world's most popular weed killer is used everywhere from backyard gardens to golf courses to millions of acres of farmland. For decades it's been touted as safe enough to drink, but a growing body of evidence indicates just the opposite, with research tying the chemical to cancers and a host of other health threats. In Whitewash, veteran journalist Carey Gillam uncovers one of the most controversial stories in the history of food and agriculture, exposing new evidence of corporate influence. Gillam introduces readers to farm families devastated by cancers which they believe are caused by the chemical, and to scientists whose reputations have been smeared for publishing research that contradicted business interests. Readers learn about the arm twisting of regulators who signed off on the chemical, echoing company assurances of safety even as they permitted higher residues of the pesticide in food and skipped compliance tests. And, in startling detail, Gillam reveals secret industry communications that pull back the curtain on corporate efforts to manipulate public perception. Whitewash is more than an exposé about the hazards of one chemical or even the influence of one company. It's a story of power, politics, and the deadly consequences of putting corporate interests ahead of public safety. Carey Gillam is a veteran journalist, researcher, and writer with more than 25 years of experience covering corporate America. A former senior correspondent for Reuters’ international news service, Gillam digs deep into the big business of food and agriculture. She is currently Research Director for the nonprofit U.S. Right to Know. "Many had waited for this book, and Gillam delivered...In a work that evokes 'Silent Spring,' the self-described 'Kansas girl' closely followed the international furor over Monsanto's Roundup herbicide...This timely and well-organized examination of one of the world's most compelling controversies over science and agriculture is well-researched and beautifully written." "Journalist Gillam exposes a plethora of scientific research, legal materials, and documentary evidence recovered from corporate and government resources to paint a damning picture of the peddling of glyphosate by Monsanto and other agribusinesses...Gillam expertly covers a contentious front where corporate malfeasance intersects with issues of public health and ecology." "As veteran investigative journalist Gillam points out in this unsettling report on [glyphosate] and its drawbacks, most of the positive press comes from the herbicide's manufacturer, Monsanto, who, as the title suggests, 'whitewashed' the scientific data to validate its safety...This is a must-read for everyone concerned about the increasing burden of toxic chemicals in water and food, the health and environmental consequences thereof, and corporate influence on government agencies." "Hard-hitting, eye-opening narrative...A forceful argument for an agricultural regulatory environment that puts public interest above corporate profits." "Whitewash is a gutsy, compelling read from beginning to end...a clarion call for action." "A well-documented compedium of wrongs, fraud, conflicts of interest, undue influence, and troubling forms of plain old public relations." "Gillam lays out a truly frightening yet crucial narrative surrounding the use of the famous chemical [glyphosate]." "'Outrage' is the only word that captures the experience of reading Carey Gillam's Whitewash...Her exhaustive examination of the history of glyphosate—the main ingredient in Monsanto's Roundup—reveals that a herbicide as common as laundry detergent is the health and environmental calamity of modern agriculture...This is a story about what happens to public health and the environment when capitalism overthrows the social contract and the fever for profit poisons the heart against all morality." "Must-read...Just as Rachel Carson started the environmental revolution which led to getting the dangerous pesticide DDT banned over 40 years ago...I believe [Whitewash] will have the same impact on our world." "Though investigative reporting, Gillam unveils Monsanto's dubious playbook, from bankrolling supportive scientists to blackballing critics and strong-arming regulators...Whitewash's release could not be better timed." "Presents a compelling account of this herbicide's troubled history and a commentary on corruption in the agriculture industry." "A wake-up call for us all." 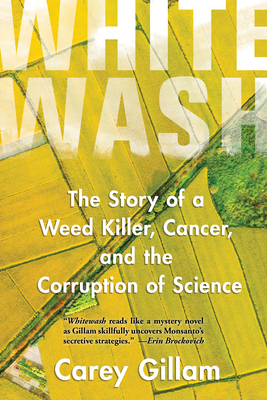 “Whitewash reads like a mystery novel, as Gillam skillfully uncovers Monsanto’s secretive strategies to convince countries around the world that its Roundup products are safe. The book unravels a tapestry of pesticide industry tricks to manipulate the scientific truths about their products while placing profits above human health and the environment. As someone who has experienced similar actions by corporations firsthand in my work far too often, I am hopeful that Carey’s book will be a wake-up call for more transparency about the dangers surrounding many chemicals in the marketplace." "In the grand tradition of Silent Spring, Carey Gillam's Whitewash is a powerful expose that sheds light on a chemical that — to most of us — is both entirely invisible and yet profoundly damaging to our bodies and our environment. It is a deeply researched, entirely convincing account of the politics, economics, and global health consequences implicit in the spread of the world’s most common herbicide. Gillam has done what all great journalists strive to do: she has made us see clearly what has long been right before our eyes. Highly recommended." "Whitewash, says Carey Gillam, is what Monsanto, Monsanto-paid scientists, and the Monsanto-influenced EPA are trying to do for the herbicide glyphosate ("Roundup")—make it appear benign in the face of evidence that glyphosate may be carcinogenic, strongly promotes weed resistance, and causes genetically modified crops to require even greater use of toxic chemicals. Gillam's deep dive into corporate manipulation of science gives us even more reasons to advocate for organic and sustainable agricultural systems." "Carey Gillam is a brave warrior in the mold of Rachel Carson. She has exposed the ruthless greed and fraud which have led to the poisoning of our planet. The bell is tolling and the Monarch butterflies are disappearing. It is urgent to seek the support, knowledge, and innovation needed to save humanity from further environmental destruction and even extinction." "Carey Gillam has brilliantly assembled the facts and describes how Monsanto and other agricultural chemical companies lied about their products, covered up the damaging data, and corrupted government officials in order to sell their toxic products around the world."